f you do not wish to swim on any particular occasion, then you are still welcome to come on down and help out with organising an event or simply helping with the timing. Perfect seaside enjoyment to start your weekend in summer !!! Based upon members of the Eastern Suburbs Ladies Swimming Club founded in 1906, the current club was established in 1916 as a ladies only swimming club. We are now a group of male and female amateur swimmers of all different skill levels who enjoy getting together to swim at Bronte pool on a Saturday morning in the summer season. 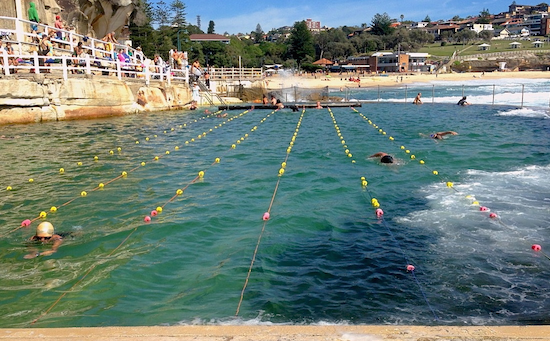 We believe swimming at the glorious Bronte on a Saturday morning is the best way to start the weekend. Swimmers range from age 3 to grandmothers and grandfathers, beginners to competitive racers, each swimming various distances of all strokes and styles (dog paddle included). We run handicapped races to ensure everyone gets a turn to have that winning feeling. We swim each Saturday from October to April (depending on the weather) starting at 8.45 to check in before starting our first race at 9am. If you'd like to join us contact us or roll up one Saturday morning and look for someone with blue swimmers or a stopwatch.